A microplate chemiluminescence enzyme immunoassay (CLEIA) with high sensitivity, selectivity and reproducibility was developed for the determination of free thyroxine (FT4) in human serum. A competitive assay has been utilized with horseradish peroxidase (HRP) labeled thyroxine analog in the chemiluminescence (CL) detection. The CL signal produced by the emission of photons from luminol was directly proportional to the amount of analyte. The linear range was 0.45-7.5 ng dL-1 and the detection limit was 0.09 ng dL-1. Experimental conditions, such as temperature, pH, incubation time, titration level and other relevant variables upon the CL signal have been examined and optimized. 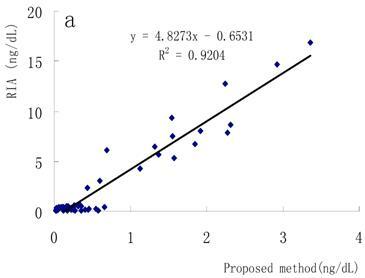 A coefficient of variance of less than 16% was obtained for intra- and inter-assay precision. The present method has been successfully applied to the analysis of FT4 in human serum. The positive and negative coincidence ratios are satisfactory. Good correlations were obtained between the results by the proposed method and radioimmunoassay (RIA), as well as a Bayer ACS-180SE detection system. Thyroxine (3,5,3',5'-tetraiodothyronine, T4) is an important hormone secreted by the thyroid gland. It has a molecular mass of 777 Dalton and is involved in regulating many biological functions, such as oxygen consumption, growth, development and protein synthesis. More than 99.9% of the T4 in blood is bound to carrier proteins, specially to thyroxine-binding globulin (TBG), and the free fraction of T4 (free T4, FT4) just accounts for ∼0.03% . But the FT4 represents the biologically active form of this compound. It is believed that FT4 could cross cell membranes and interacts with receptors , showing metabolically active and clinically relevant effect. Therefore, measurement of FT4 is of value in assessing thyroid function. Various methods have been employed to the determination of FT4 in serum, such as equilibrium dialysis [3-7], ultrafiltration , chromatography on polyacrylamide gel [9, 10] or Sephadex  , radioimmunoassay (RIA) by use of the radioactive isotope 125I [12-14], enzyme immunoassay [15-17], time-resolved fluorescence , bioluminescent immunoassay , fluoroimmunoassay [20-23], ,chemiluminescence immunoassay [24, 25], electrochemiluminescence immunoassay [26, 27], and mass spectrometry [28, 29]. These methods have disadvantages. Direct methods are complex and time consuming. RIA uses radioactive labels and is harmful to the operators. ELISA has low sensitivity. Immunoassay with chromatography needs a lengthy procedure of column preparation and expensive instrumentation. Electrochemical method requires preparation of working electrodes and complicated operation. Chemiluminesence enzyme immunoassay (CLEIA) has high sensitivity and specificity. It has been widely used in clinical and biomedical researches due to such advantages as no radioactive waste, relatively simple and inexpensive instrumentation, low detection limit and wide dynamic range. Generally, chemiluminesence detection techniques use horseradish peroxidase (HRP) or alkaline phosphatases (ALP) as label for enzyme immunoassay. These enzymes are labeled to the antibody or antigen molecules. The chemiluminesence substrates undergo a peroxidase-catalyzed oxidation in the presence of a suitable oxidant. After the immunological reaction, the chemiluminesence intensity of the label is detected for the quantitative analysis of antibody or antigen. 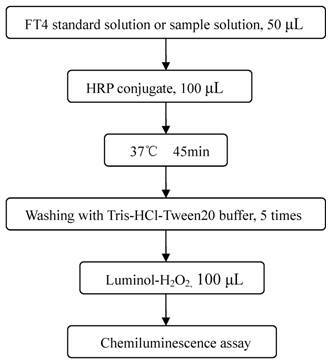 In this paper, a chemiluminesence enzyme immunoassay for the determination of FT4 is proposed. FT4 presenting in a patient's serum competes with enzyme-T4 analog conjugate for anti-T4 antibodies attached to a solid phase. 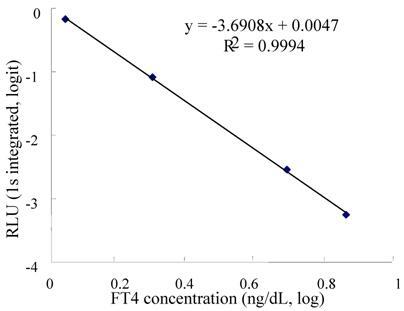 The amount of enzyme-T4 analog conjugate binding to the solid phase varies inversely with the concentration of FT4 in the serum, constituting the estimation of FT4 concentration in the serum. The competitive reaction principle is shown in Figure 1. It is based on the HRP-T4 analog conjugate and the chemiluminesence reaction between the enzyme substrate of luminol and hydrogen peroxide. T4 standard was obtained from Sigma (St. Louis, USA). Goat anti-T4 polyclonal antibody was purchased from Si Chuan Zheng Long Company (Si Chuan, China). HRP-T4 analog conjugate was obtained from BAHT Co., Ltd. (Beijing Atom High Tech Co., China). Human sera samples were purchased from Beijing 301 Hospital (Beijing, China). The coating buffer is citrate acid (0.06 mol L-1, pH 4.8). The blocking solution was 0.02 mol L-1 phosphate buffer containing 1% (w/v) BSA and 5% glucose, pH 7.4. The washing solution was 0.01 mol L-1 Tris-HCl buffer containing 0.05% Tween-20, pH 7.5. Dilution solution for HRP-labeled T4 analog was Tris-HCl buffer, pH 6.5. The chemiluminescence substrate were luminol in 0.1 mol L-1 Tris-HCl of pH 8.5 and H2O2 in citrate buffer of pH 4.5. A chemiluminescence microplate reader (BHP9504 from Hamamatsu Co., China) was used. A microplate mixer (WZ-2A, Beijing Haidian Medical Instrument Factory, Beijing, China) was employed to blend the solutions in microwells. The incubation procedures were carried out using constant temperature incubator (PYX-DHS, Shanghai Medical Instrument Factory, Shanghai, China). An automatic plate washer was used to wash the microplates (DEM-III, Tuopu Analysis Instrument Company, Beijing, China). Immunoassay procedures were presented in Figure 2 . The microplates were coated with 100 μL of T4 antibody (2.5 μg mL-1) each well in citrate buffer (pH 4.8). The plates were allowed to stand sealed at 4 ℃ overnight. Then, the plates were decanted (tapped and blotted) and post-coated with 300 μL blocking buffer for 1 h at 37 ℃. The blocking solution was discarded before assay. In each reaction, 50 μL T4 standard solutions or serum samples and 100 μL diluted HRP-T4 analog conjugate were added and incubated for 45 min at 37 ℃. After the competitive reaction, the plates were washed five times and 100 μL chemiluminescence substrate solution was added, and the emitted photons were measured. The equilibrium between bound T4 and FT4 is dependent on the temperature. It has been shown that when the temperature increases from 20 ℃ to 37 ℃, the concentration of FT4 is doubled . pH seems to influence the equilibrium between the bound T4 and the FT4 too [32-34]. The immunoassay reaction was performed at 37 ℃ and room temperature, respectively. At 37℃, the detection limit was lower and the R (linear correlation coefficient) was higher than those at room temperature. Thus 37 ℃ incubation time was used. 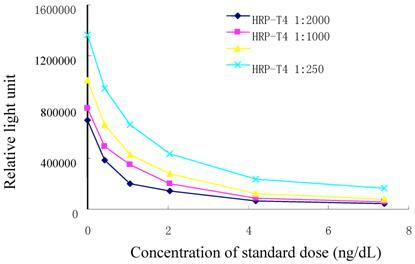 The effects of pH on the assay performance on the assay performance parameters, including R, RLUmax (maximal relative light unit), IC50 (the T4 concentration causing 50% inhibition of RLUmax), RLUmax/IC50 was also studied (Table 1). It showed that IC50 value reached a maximum and the correlation coefficient was better at pH 6.5. Thus pH 6.5 was chosen. Surfactants were commonly used in ELISA to reduce nonspecific interaction. The influence of Tween-20 on assay performance was examined and the results were shown in Table 2. Tweeen-20 could interfere with the active sites of reactant molecules which had an impact on the CL signal . The RLU is so high in the absence of Tween-20 that the sample with low, medium, and high concentration can not be distinguished. In the presence of 0.05% Tween-20, the three samples could be distinguished well. Therefore, 0.05% Tween-20 was selected. Adding analyte analog to the sample could influence the equilibrium between the free and protein-bound fractions of T4, bringing bad assay reproducibility. Thus inhibitors of sodium salicylate and sodium trichloroacetate were tested. Samples with low, medium, and high concentration were chosen to evaluate the effect of the inhibitors. Compared with sodium trichloroacetate, the correlation coefficient was better and stable, and the low and high sample concentration could be distinguished well in the presence of 0.01% sodium salicylate, thus 0.01% sodium salicylate was selected in the subsequent work. The results were shown in Table 3. Titer levels of labeled T4 analog were determined. Upon every dilution we monitored the RLU of T4 standard. When the titration was higher than 1:500, the sensitivity was not satisfied. While the titration was lower than 1:2000, the signal was decreased rapidly. The results were shown in Fig. 3. Therefore, titration level of 1:500 was set. In a competitive ELISA, the interact time between immunoreagents may have a direct effect on the sensitivity of the immunoassay . We varied the incubation time from 15, 30, 45, 60, 90 to 120 min, and assessed the variations of RLUmax and RLUmax/IC50. Results were shown in Figure 4. 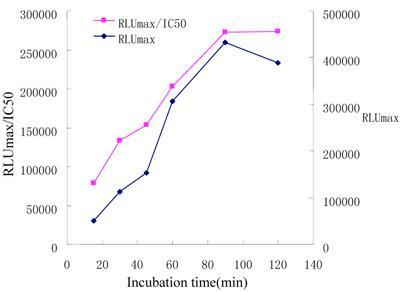 The RLUmax increased with longer incubation time in the range of 15~120min. After 90min, the RLUmax did not change evidently. This means the immunoassay reached an equilibrium. RLUmax/IC50 ratio reached a maximal value at incubation time of 90 min. In order to achieve an appropriate sensitivity suitable for clinical application, an incubation time of 45min was set. Under the optimal conditions, the standard curve obtained with the chemiluminescence detection of enzyme activity was presented in Fig. 5. The linear rang was 0.45-7.5 ng dL-1. The sensitivity, defined as the minimal does that can be distinguished from zero, the minimum detected concentration (mean-2S.D. of zero standard, 10 replicates) of FT4 was 0.09 ng dL-1. The intra- and inter-assay precisions, calculated by measuring FT4 concentration in three different samples, were performed. Good precisions were obtained. The intra- and inter-assay coefficients of variation (CV) varied from 5.3 to 15.6%. The specificity of the immunoassay was dependent on the antibody's specificity . The cross-reactivity of the anti-T4 antibody was evaluated using several T4 disrupting compounds. 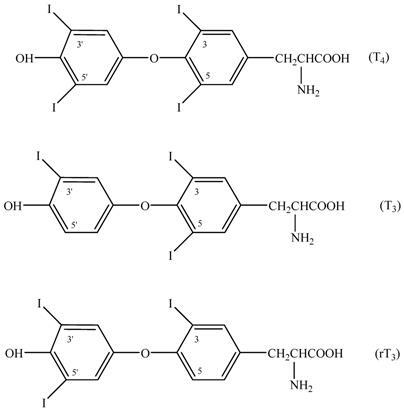 3,5,3'-triiodothyronine (T3) and 3,3',5'-triiodothyronine (reverse T3, rT3) were the structurally related compounds of T4 (Figure 7) and were tested in this work. The cross-reactivity was calculated by deriving a ratio between does of interfering substance to does of thyroxine needed to displace the same amount of the conjugate. The results were shown in Table 4. The antibody exhibited cross-reactivity all less than 0.01%. Therefore, effects of T3 and rT3 in serum on FT4 determination could be neglected. Amount of the interfering substances were added to a serum matrix. The effects of some potential interferences on the determination were shown in Table 5. Sodium citrate and heparin enhanced the CL signal and others inhibited the reaction. The method was simple and sensitive, but these substances need to be removed before it could be used for FT4 determination in blood samples. A study of 70 normal human sera were undertaken to determine expected values. The results were presented in Table 6. 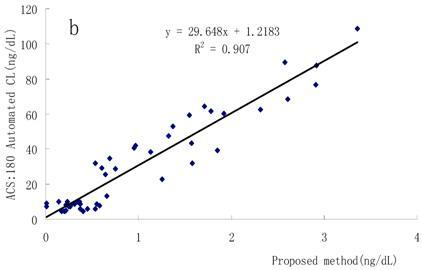 It can be seen that the correlation coefficient was 0.9988, Ū presenting mean sample values was 1.043 ng dL-1, and standard deviation (SD) was 0.370. The expected values (Ū+2SD) ranged from 0.303 ng dL-1 to 1.783 ng dL-1. Serum samples of normal people and hypothyroid or hyperthyroid patients collected from 301 Hospital were examined. The results were shown in Table 7. The positive and negative samples could be distinguished well and the coincidence ratios were 98% and 97.5% for positive and negative samples, respectively. FT4 concentrations in the sera were simultaneously determined using the present method, a conventional RIA method and a Bayer ACS-180SE detection system. Good relationships were obtained as shown in Fig. 6a and Fig. 6b, which means this method has great potential in the clinical diagnosis. A highly sensitive and selective microplate CLEIA demonstrated for the determination of FT4 in serum samples has been developed and optimized. The proposed method comprises anti-T4 antibody coated microplate, HRP-labeled T4 analog and a CL detection system. With the assay, FT4 can be reproducibly detected in human serum at a concentration as low as 0.09 ng dL-1. A stable calibration curve was also established with the linear correlation coefficient of 0.9997. Data from the developed method highlights the acceptable intra-assay (less than 11%) and inter-assay (less than 16%) precision. In summary, this assay provides apparent advantages and shows great potential in the clinical diagnosis. The authors gratefully acknowledge financial support of the National Natural Science Foundation of China (20437020, 20575008) and the Program for Changjiang Scholars and Innovative Research Team in University (IRT0404). Correspondence to: Prof. Dr. Jin-Ming Lin, Department of Chemistry, Tsinghua University, Beijing, 100084, China. Tel/Fax: +86-10-62792343. E-mail address: jmlintsinghua.edu.cn.